This is verse 3 of Frederick Lehman’s hymn “The Love of God” (1917). This verse is apparently an adapted translation of a Jewish poem by Meir Ben Isaac Nehorai (1050). It seems that the hymn-writer found it scribbled on the walls of a patient’s room in an insane asylum after the death of its occupant. Whatever its origins, it is a wonderful and unusually striking piece of devotional writing. Thanks to Brad Jersak for using it in his great new book A More Christlike God: A More Beautiful Gospel (CWR Press, 2015). 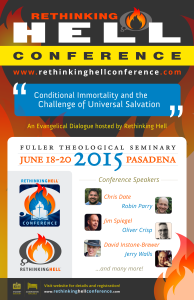 So the 2015 Rethinking Hell conference, held at Fuller Theological Seminary, is over and I am back at home in the UK. Here are a few brief reflections on the conference. 1. The most immediately striking thing about the conference is that it was a genuine discussion between conditionalists (the conference organizers), traditionalists (or perhaps modified traditionalists), and universalists. There was a real spirit of genuine respect for one another as fellow siblings in Christ. There was real listening. There was therefore real openness to modify or change views in light of the conversation. That is unusual on such a hot topic. 2. The quality of the papers was really very good—at least the ones that I heard. There was some solid, biblical, theological, and philsophical reflections from some “top dogs.” Very thought-provoking and enjoyable. The respect and love certainly did not stop people offering clear critiques of one another. (There were certainly a few worthwhile critiques of my own work.) This was not a conference of wooly thinking! 3. I really enjoyed meeting folk—pastors, professors, students, and plain thoughtful Christian folk. There was a great lunchtime discussion with some students about atonement—fascinating! There was banter with Jerry Walls—that guy is a hoot and full of fascinating ideas. There was the sheer joy of hanging out with Oliver Crisp—words cannot express how much I enjoy Oliver’s company. There was Brad Jersak—such a lovely guy! And wondeful time chatting with Eric Reitan, Greg Stump, Jim Spiegel, Chris Date, Peter Hiett, David Instone-Brewer, Jordan Wessling, and a whole bunch of other folk (who will no doubt be upset that I did not mention them. Sorry—but my list is already too long). 4. It became clear to me that a more adequate exegetical response to annihilationism is still required and needs to be written. Annihilationism is a serious position that deserves a proper exegetical critique. (I think that there are very good theological and philosophical critiques, but the exegetical case needs more attention.) Alas, I don’t have any time to do this in the next few years, but if God keeps me around long enough I may do it one day. 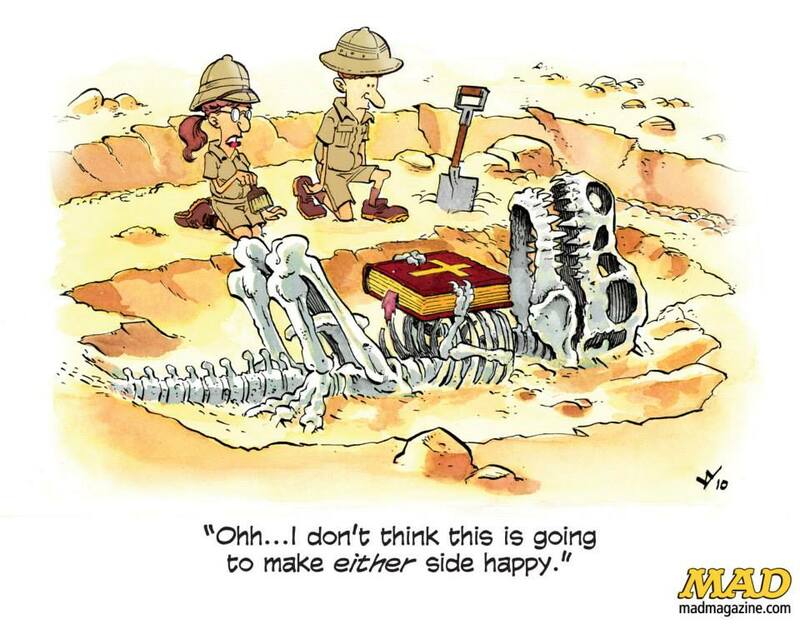 However, in the meantime it would be a good project for a young scholar. So—exciting times! Glad for the conversation and the provocation. Oh bum . . . ! The best dialogue on hell this side of the eschaton? I am really excited about the fast-approaching Rethinking Hell Conference to be held at Fuller Theological Seminary, June 18–20. There are some key folk representing all of the three main Christian views on hell there. I mean, Jerry Walls! Wow. His new book, Heaven, Hell, and Purgatory (Brazos, 2015), is really excellent (though we disagree on the freewill defense). Given that Jerry defends eternal hell against universalism you’d be surprised how close our views are. Oliver Crisp! Dudes! That guy rocks. Eric Reitan and John Kronen! Weep for joy! David Instone-Brewer on the rabbis. That one will be fascinating. David knows his rabbinincs. And a whole host of other folk who seem to be genuinely interesting. You can see the whole program at the website here. It is not too late to book. In fact, I think that there is currently a $25 discount code available. The message of the gospel is one of those messages that can be expressed in so many different ways and it benefits from all this diversity. But if I had only one sentence available, how would I express it? Hmmmm. Tricky. OK. Here is a first attempt. God has acted in Jesus the Messiah—through his incarnate life, death, resurrection, and ascension—to set the world right and to bring creation to its intended destiny. If you had one sentence, how would you express the gospel? “It is finished!” What is finished? I have always been told—and have always believed—that when Jesus cried, “It is finished!” he meant that his work in bearing the sins of the world was completed. But it struck me about ten minutes ago that there is a problem with this: when Jesus uttered those words he was not dead (obviously). But the church affirms that Christ died for our sins. So it cannot literally be true that his cross-work was completed when he said those words. That was not finished—at least not in every respect. This has some bearing on what we say about Christ’s descent into Hades. This ancient belief has received a range of interpretations over the centuries, but the most basic division in the interpretations is between (a) the views in which Christ was thought to be among the dead as the victor proclaiming his triumph and (b) those in which he was among the deceased as one who “stood” in solidarity with the dead, suffering death’s humiliation and Godforsakenness. Now one argument against the latter range of views is that Christ’s humiliation ended on the cross—after all, he said that it was finished. So the descent could only be a victorious descent. But if the words “It is finished!” do not mean that Christ has no more sin-bearing then the way is opened up to see the descent as an integral part of Christ’s humiliation—his being dead. That said, I see no reason why we need to play off (a) and (b) against each other. I think that the descent is a pivot element in the story and can be seen both in terms of humiliation and exaltation, cross and resurrection. That’s for another time. Anyway, here is my question: what is finished?